Have you ever had one of those Valentine's that you thought might hurt you but you just couldn't resist? Fatal Attraction Agave is that plant. This spiny little guy has beautiful deep green foliage with a lighter green center stripe and red margins. Oh, and those margins? Have some wicked red teeth! Also a terminal spine. Careful where you plant this one! It will get about 1 or 2 feet tall and wide. Probably not the best choice for a walkway. Don't let that scare you away though, it's also got its charms. It's deer resistant and a super low water user making it super easy to grow. 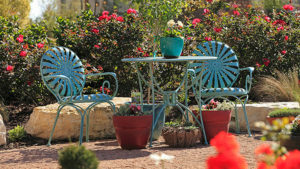 It will look great in your rock garden or mixed with blooming perennials. Maybe even mixed in with some cascading rose bushes. They also do well in containers. If you can't resist Fatal Attraction, grab one quick, we only received a handful. 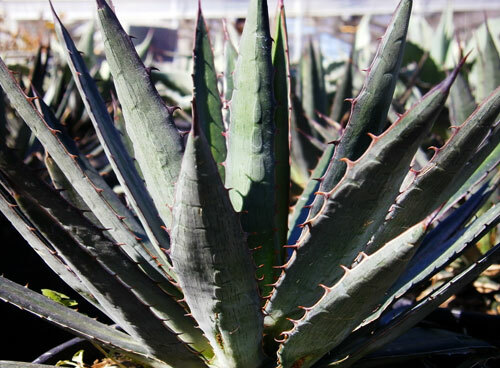 We also got a TON of new agaves and yuccas if this particular agave is not your type. Come take a look! Stock up on Stock! Get it? Huh? Bad joke. Sorry. Here is an annual that we see in early spring and late fall at The Garden Center. As you can see from the photo, it blooms repeatedly when it's cooler. This annual blooms in pink, white and shades of purple. The blooms are also fragrant! It also tolerates a light frost and has few pest problems. Plant it in full sun to part shade with well draining soil. Keep the flowers going by deadheading often. Fertilizing every 4 to 6 weeks will also keep the blooms coming! 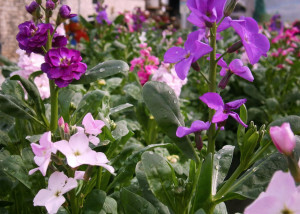 This colorful plant makes a great filler plant in beds or containers and can be used as a border.